hich existed for a long time, before the Sikhs and the British stole its bricks away. Some years back they were digging the foundations for a house on Mohni road, and they came across the relic of an old lost ship. Again nobody bothered. The wood was no good for modern use, not was there any gold attached. Rusted iron and withered wood, that was it. Nothing good for the treasure hunters of today. This was the way of the trail of the old river Ravi. We in Lahore used to call it Buddha darya (old river), and relics were there for a long time. It must have indeed been a spectacle, for it was so big, that to drag it to water, a thousand persons were called in to help. There was indeed not enough water at that time to make the transition easy. But it was done. A proud feat for the Mughal Industry. In the ‘Maseray-Raheemi’ of Abdur Raheem Khan e Khanaan, we are told that this Royal Courtier also had a ship built, to enable selected citizens to perform free Haj every year. The prospective Hajis used to avail the facility. Shah Shuja was also fond of ships and had ships stationed in Surat, the later ship yard of the British. Aurangzeb also used to ride ships. He was seen in a ship in Benaras itself. 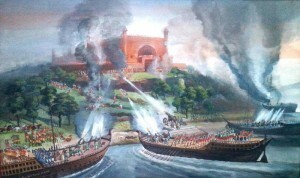 But the big event was the inauguration of the Badshahi Mosque Lahore, when Aurangzeb came in a ship to inaugurate it. An incident happened at that time, when from the bank, a mad man threw a brick at him. The man was caught but the Emperor had him set free. That was the justice of those incredible rulers. In any case very little gets written about Lahore, and it is our job as citizens of Lahore to tell it to the world. The achievements of Lahore always worthy of praise by all. Emperor Akbar, who ruled much of India in the latter half of the 16th century, apparently had a great interest in modern shipbuilding. This might have been sparked in part by his relations with the Portuguese (who had established themselves at Goa by this time) and their modern warships. 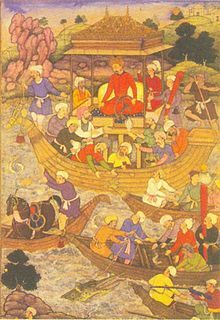 It is known from the Akbarnama and Ain-e-Akbari that several large, ocean-going ships were built in India under Akbar’s reign, at Lahore and Ilahabas (Allahabad). The first such ship was built in June 1592 near Lahore; construction could not place near the coastline itself due to a lack of timber. The ship was built of 3000 large wooden planks and roughly 12 tons of iron was used, with a keel measuring close to 100 feet in length. This would make it on par with the galleons being built in Europe at the same time. The constructed ships were transported by massive barges to the Mughal ports in Sindh, where they were put to sail in the Arabian Sea. 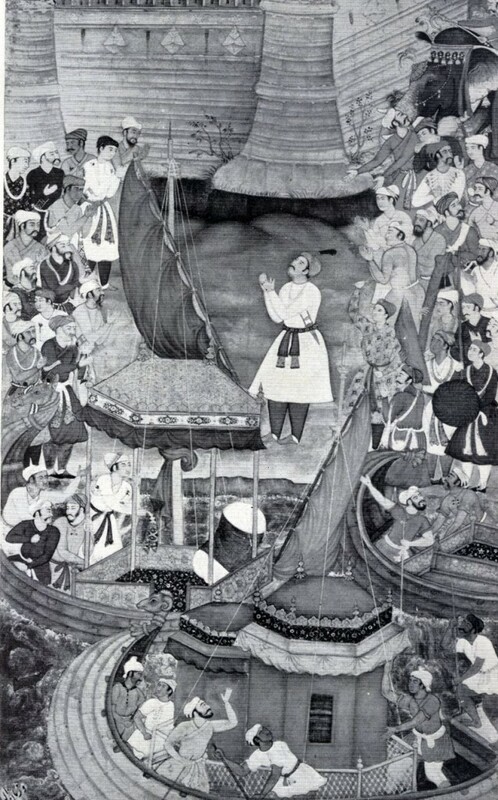 Unfortunately, Akbar’s successors did not share his enthusiasm in shipbuilding, and a modern ocean-going Mughal navy comparable to those of European powers never materialized. But what if the successors of Akbar had invested more resources in the development of a navy? How would it affect the commercial and political interactions between India and the European powers in the 17th and 18th centuries? Previous PostWHEN JOSEPH S FARLAND CAME CALLING AMERICAN AMBASSADOR AT CHUGHTAI HOMENext PostUNDERGROUND TUNNELS OF LAHORE – NOT MYTHICAL BUT A REALITY! So the Mughals were well into ship building. And it was happening in Lahore, means the tech they has was pretty reliable and indigenous. What made them abandoning the development at that time ? ……. any possible reasons ? This must be a real dilemma for the historian. The Portuguese are what happened. The Spanish Armada was the fright of the oceans in that time, so when Portuguese came to India, they quickly gained control of all our major ports, signing treaties with the Mughals that they’d protect their waters – since they now owned them – so India didn’t need to build her own navy. Indian fishermen had to apply for licenses from the Portuguese just so we could ply our own waters. It was partly for this reason that the Mughals favored the East India Company and the British, as the British navy has always been the world’s best navy and by allowing them to trade with us, we were able to play them off against the Ports and beat them off our ports lol. The lighter and smaller English galleys had to fight and beat the great Portuguese ones to get here and earn the emperor’s favor.